Leonardo da Vinci’s painting of the Last Supper in Santa Maria delle Grazie painted in 1498. Wikimedia, public domain. Another ancient riddle presents itself in this fabulous and famous painting of the Last Supper by Leonardo da Vinci. It is well known he was involved in secret societies. Is he revealing any secrets in this painting? The figure of Jesus creates a vertical triangle. The empty space to his right creates an inverted triangle. The man to his left is pointing upwards with his right hand. The feminine figure on Jesus’ right has a disembodied left hand slicing across his neck suggesting beheading. All the cups on the table are made of clear glass making them difficult to see. There is a large dish in front of Jesus central to the image. The image is painted and centered over a door. The window behind Jesus has an arch painted over it. The painted ceiling is a grid of 36 squares. The disciples are grouped 3 and 3 on each side. There are 3 windows on the back wall and 3 pillars on each side. A closer examination of the Last Supper reveals clues to da Vinci’s knowledge of long held secrets. Perhaps some meaning can be affixed to this possible symbolism. Are the cups on the table nearly invisible because they are not important to the real story? Is the grid work the man points to on the ceiling supposed to represent longitude and latitude lines? Are the 36 squares supposed to suggest the 360 degrees of a circle? Are the repeating 3’s used to suggest 33? Is this the 33 of Scottish Masonry or is it latitude from the North Pole which is 57 degrees north latitude where Hudson Bay lies? Is the arch above the highest window the Nastapoka Arc of Hudson Bay where it appears a massive comet impacted? Is the dish central to the image and over the door to indicate it is a large round opening? The up and down triangles are seen in the Grave Creek Stone below. The symbolism is also seen in the letter N and in the first Hebrew letter aleph which is essentially an N as well. Is he saying the ‘central mountain’ ‘went in’ to a ‘disc shaped hole’ with a pronounced arc? Does all this imply it was mother Earth itself that was beheaded? Note the similarities to other ancient art studied in previous posts as shown below. Copy of stone found at Grave Creek Mound, West Virginia, Ohio River. The middle column depicts the up and down triangles. Shaman Bear from Newark Mounds, Newark, Ohio. The man holds a decapitated head on his lap. Assyrian Relief, Detail of Cup, Brooklyn Museum. The dish on the center of the table like the dish in the relief seems to be central to the topic. Gaitskill Stone Tablet from ancient Ohio showing grid and pole at top. Baal, a Statute from Ugarit.14th to 12th BC. Louvre, Wikipedia. The man points up with his right hand and his left hand is held low. The last post about Hudson Bay as a comet crater was an excerpt from the full article, “A Planet Most Miraculous: The Mechanics of Earth’s Rotating Crust,” which is about the Earth’s unique construction. A comet that leaves a crater 1000 x 400 miles long must leave remnants behind which is exactly what we see in these images. 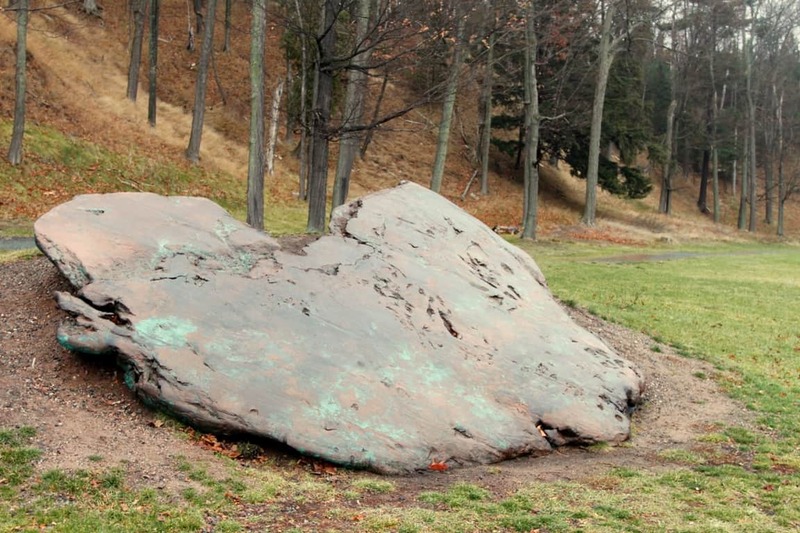 This comet was the likely source for the vast amount of pure copper mined out of Michigan thousands of years ago. It also explains the origin of the tradition of copper rings found in ancient American burials and even in European history as seen in the story Beowulf. The copper shown here is a mere 28.2 tons and the museum piece is 34 tons. 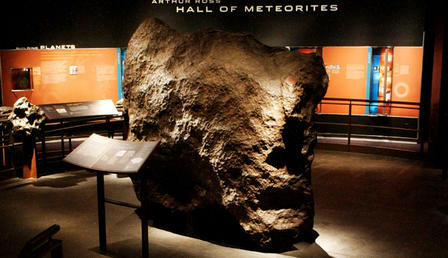 Cape York Meteorite from an impact 10,000 years ago found in 1894.
the great ice-ice mountains of Isis. They bore two holes through and carved a great dip in the tiles. The crater, melted deep and mighty, makes a crown for the head of the two footed Earth. The two feet, magnetic and north, lay the tiles which spell the story. X marks the tie at the pole. This O of a crater marks the center. What is left is the curve of the crater. It is the rightful whose cover dropped low. The point struck at the neck and the face did turn. This then is how the Earth was clothed. Compare the above to this Egyptian work of art depicting Horus. Egyptian God Horus wearing a similar hat as depicted in the Crespi Gold Plate from Ecuador. 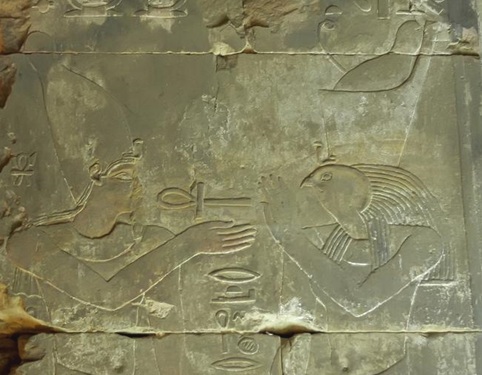 The X and O on the belt appear as the ankh mid-image.